The Heartland Poker Tour is making its triumphant return to Las Vegas and Faded Spade cards will be along for the ride. For the first time since 2014, HPT is headed back to the Sin City, and partnering with Westgate Las Vegas for a series packed full of guarantees and chances at poker fame and fortune. The series begins on March 29 and culminates with the main event final table live stream and TV production on April 9. 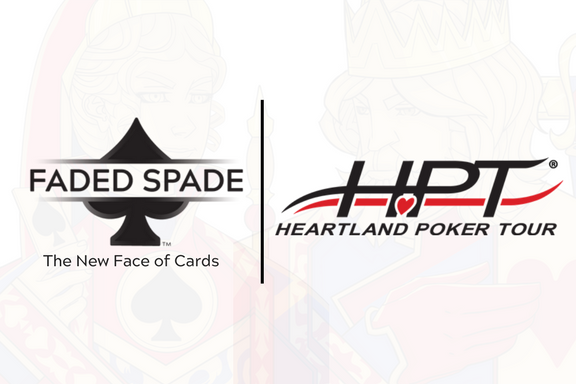 The HPT has chosen Faded Spade as their playing card brand of choice, and Faded Spade RFID cards will be featured throughout the entire championship final table. "We're excited to partner with the HPT during their return to Las Vegas," said Tom Wheaton, Founder & CEO of Faded Spade. "We believe that the HPT is one of the leading mid-major poker tour companies in the United States due to their commitment to the player experience in each of their national markets." Heartland Poker Tour players, fans and employees may use code HPT for 20% off their entire order at FadedSpade.com until a champion is crowned on April 9!